Our Twin Peaks discussions haven’t exactly lacked for enthusiastic cosigns, but I’d like to start this week’s roundtable on a note of appreciation: What a thing of beauty that “Part 11” sequence at the RR is. 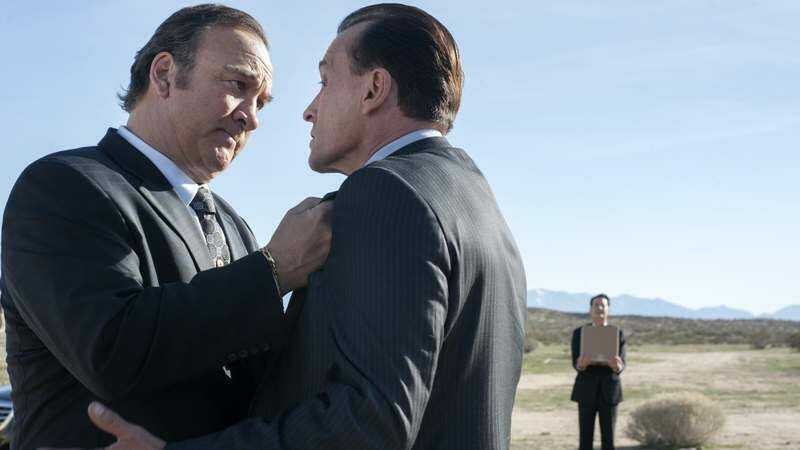 In an episode with its fair share of meticulous blocking—the seating arrangements back at Buckhorn police HQ, for example or Dougie-Coop situated squarely between the squabbling Mitchum brothers—Twin Peaks wraps up a condensed history of the Briggs family in just the way its members occupy a diner booth. We didn’t even know that Bobby and Shelly got married until Carl refers to “Shelly Briggs” on the CB; the fact that they’re sitting as far away from one another as possible indicates that they’re no longer man and wife. Becky, meanwhile, squeezes into the corner of the booth on the same side as her mom, even though dad’s the one who’s kept Becky and her no-good husband out of jail. The whole thing is fraught, an anti-Rockwell portrait as loaded as any David Lynch has ever constructed. Any illusion of family togetherness is dashed by intrusions from the outside: First the arrival of Red, and then the bullet fired from the vehicle of a separate, similarly dysfunctional family. There is the feeling of patterns that can’t be broken, of a kid duded up in camo just like his dad, or of Shelly (and now her daughter) falling for the bad boy. Bobby’s walking his own preordained path, but his turn from teenaged hood to middle-aged lawman may have snuffed out some of the fire of his once-clandestine coupling with Shelly. He’s still got the leather jacket, but it no longer covers up the sensitivity he used to reserve only for weeping about Laura’s death. Is it “déjà vu” or is it “It is happening again”? Twin Peaks gives no clear answers, only shots of stairways that echo other shots of stairways, and a map full of familiar, ominous symbols. Get too close, and you run the risk of suffering the same fate as William Hastings, his skull crushed in the back of a squad car. (Quotes Gordon Cole, in the comedy highlight of the week: “Yep, he’s dead.”) Take these signs too literally, as Bradley Mitchum does with his dream about Dougie, and you might wind up causing yourself more trouble than you asked for. Probably best to let this stuff simply beckon you forward, the way it does with Dougie-Coop. You’re in good hands here, even if they’re hands that craft startling visions like the “sick” child in the screaming woman’s passenger seat. Let the one-armed man show you the way—they’ve got a cherry pie there that, for once, won’t kill ya. It’s not just fractured families that pass in and out of our field of vision this week. The world of Twin Peaks is also being invaded by those mystery men of evil, the woodsmen. We first caught sight of them in “Part 2,” when one occupied a cell a few doors down from Bill Hastings, then floated off into the ether. When the next one appeared a few weeks later, walking down the hallway toward the morgue in “Part 7,” it was a nerve-rattling slice of classic horror-movie pacing, but it also made the “dirty bearded man” (to use Gordon Cole’s description) seem like a flesh-and-blood creature, someone existing firmly in this dimension. That got more muddled the following week, when the game-changing origin-story episode gave us some context for his existence. After watching a whole gang of them descend upon Doppel-Cooper and bring him back to life, we learned that these beings are tied to Bob and the nature of evil—they’re evil’s underlings, so to speak—and they serve whatever nefarious ends are pursued by that dark consciousness. So when the solitary man flits in and out of both our and the characters’ fields of vision, seemingly drifting in and out of this reality as he (it?) chooses, we now know no good can come from the appearance. And sure enough, once Albert pulls Gordon back from the brink of the strange portal, poor Diane is the one who is forced to grapple with the apparition’s violent endeavor. Lynch films these scenes in a way that suggests that while it’s possible to see the woodsman pass in and out of corporeal form, it’s hard to hold on to the impression of his presence. Even after seeing what’s left of William Hastings, it takes Diane a while to put the pieces together, just as it takes some discussion for Gordon and Albert to recall seeing him earlier. The woodsman is both there and not, both a haunting presence and a hazy image only dimly realized. At least, until he decides to rip open your skull. But that both-there-and-not nature of evil seemed to be at play in all areas of the story this week. It was in Hawk’s map, containing both mere symbols and ominous portents of what may come to pass, backed up by the Log Lady’s warnings. It was in the Briggs family drama at the diner, every moment of tenderness and support undercut by the intrusion of menacing outsiders, as Erik points out. And it’s in every aspect of the Dougie-Coop situation, whether saved by cherry pie or no. The Mitchum brothers may have decided Dougie is one of the good guys, worth keeping around, but all it takes is one brief moment of Candie’s dazed stare to remind us that this whole situation is wrong, very wrong. Something tells me that whatever black fire Hawk and Sheriff Truman are heading into holds the key to bringing back the real Dale Cooper. Like his sinister counterpart and the dirty bearded men, right now he’s between worlds—both here and not.